The battle is on in Zulu. The 1964 epic adventure war film Zulu makes its Blu-ray debut on the 50th anniversary of the film’s London premiere, and the 135th anniversary of the Battle of Rorke’s Drift at the film’s center. 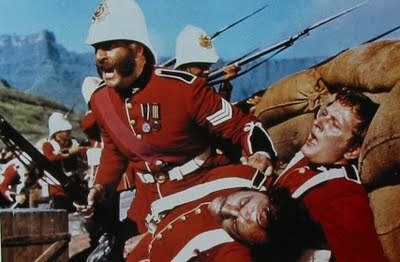 Directed by blacklisted American screenwriter Cy Endfield in gorgeous Technicolor (and with the Super Technirama 70 widescreen process), the movie depicts the historic 12-hour clash between some 150 British colonial soldiers and more than 4,000 Zulu warriors during the Anglo-Zulu War in 1879. Starring Stanley Baker, Michael Caine (Dressed to Kill), Jack Hawkins (Lawrence of Arabia), Nigel Green, and James Booth, the film offers exotic adventure, breathtaking battle sequences and a potent anti-war sentiment. The bonus features for the Blu-ray have not been announced yet, but we’re hoping that one of them is an isolated audio track of composer John Barry memorable score. As supplier Twilight Time prints up only 3,000 copies of each title, be prepared to pre-order this one directly from distributor Screen Archives as soon as the prebook date is announced, which will probably be in mid-December.